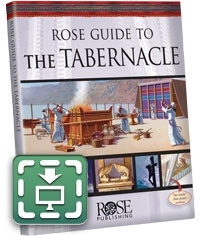 Rose Guide to the Tabernacle won the 2009 Christian Retailers' Choice Awards for best Bible Reference and Study Book. Full color, reproducible book on the The Tabernacle, with clear plastic overlays of the coverings of the "tent of meeting." The Tabernacle was the place where the Israelites worshiped God after the Exodus. Learn how the sacrifices, utensils, and even the structure of the tabernacle were designed to show us something about God. See the parallels between the Old Testament sacrifices and priests' duties, and Jesus' service as the perfect sacrifice and perfect high priest. The Ark of the Covenant was at the center of worship. Contains illustrations, charts, and diagrams not available elsewhere. 128 pages, full color with 8 clear plastic overlays showing inside/outside of the tabernacle; plus dozens of reproducible charts. You may reproduce up to 300 copies of any chart free of charge for your classroom. To understand salvation, God's original design for the world and his deep love to redeem a broken world, Christians need to understand the Old Testament, the Tabernacle, how God met his people. Rose Guide to the Tabernacle (Rose Publishing), by Benjamin Galan and Brent Ashby, answers the question, "How can a holy God live among corrupted people?" Galan explains the importance of understanding the Tabernacle. "The Tabernacle was a movable tent in the Wilderness of Sinai that God commanded Moses to build. It represented God's desire to live among His people. Studying the Tabernacle will give Christians a greater understanding and appreciation of God's plan for redemption and our calling to be holy," adds Galan. 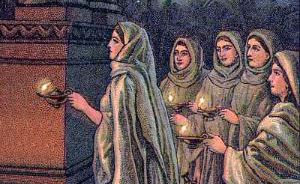 o The symbolism of the Golden Lampstand, the Table of the Bread of Presence, the Altar of Incense. o Elements of Passover and a "Christian Seder"
Rose Guide to the Tabernacle contains 128 pages of facts, illustrations, charts, and diagrams not available in other books. It also includes eight clear plastic overlays showing the inside and outside of the Tabernacle and "tent of meeting," plus dozens of reproducible charts. Readers will gain insight to the parallels between the Old Testament sacrifices and priests' duties, and Jesus' service as the perfect sacrifice and high priest. Through the Tabernacle readers will better understand the doctrines of sin, creation, salvation, justification, and God's sovereignty. Rose Guide to the Tabernacle is also the winner of the 2009 CBA Retailers' Choice Award for Bible Reference/Bible Study. You were in Eden, the garden of God. Your clothing was adorned with every precious stone--red carnelian, pale-green peridot, white moonstone, blue-green beryl, onyx, green jasper, blue lapis lazuli, turquoise, and emerald--all beautifully crafted for you and set in the finest gold. They were given to you on the day you were created. You were in Eden, the garden of God. Every kind of precious stone covered you: carnelian, topaz, and diamond, beryl, onyx, and jasper, sapphire, turquoise and emerald. Your mountings and settings were crafted in gold; they were prepared on the day you were created. You used to be in Eden— God's paradise! You wore precious stones for clothing: ruby, topaz, diamond, beryl, onyx, jasper, sapphire, turquoise, and carbuncle. Your settings were crafted in gold, along with your engravings. On the day of your creation they had been prepared! You were in Eden, the garden of God. Every precious stone was your covering, the ruby, topaz, and emerald, the chrysolite, onyx, and jasper, the sapphire, turquoise, and beryl; your settings and mounts were made of gold. On the day you were created they were prepared. You were in Eden, God's garden. You were covered with every kind of precious stone: red quartz, topaz, crystal, beryl, onyx, gray quartz, sapphire, turquoise, and emerald. Your settings and your sockets were made of gold when you were created. The Father dispatched his mighty Messenger to prepare the Earth and a young virgin for the birth of His Son. The Archangel Gabriel left at once and the Holy Spirit followed close behind. Then the Father turned to Jesus and said, I desire to make Myself known in the visible realm. So go My Son. Show them who they are so that they may show others who I am. Show them how to live right. Redeem and reconcile them back to Me. I will Father. Jesus replied. Then He took off the purple Ephod of Royalty and he blue Robe of Divinity and laid them beside the Throne. Now wearing only the White Tunic of Humanity the royal Son of God was transformed into the humble Son of Man. With complete confidence in His Father's plan, He declared, I am ready. The Father kissed His Son on both cheeks and embraced Him one last time before His departure. Secure in His Father's love, Jesus smiled and spoke softly. I will faithfully perform Your will Father and draw all men to You. Then Jesus left the realm of the invisible and with the help of the Holy Spirit became manifested in the womb of a young woman. Nine months later, He made His entrance into a lost and dying world. The Word of God was now flesh and blood; a tiny baby, vulnerable and totally dependent on His new earthly parents. Mary and Joseph raised Him well and He grew in wisdom and stature. The years past and then at age 30, Jesus knew it was time to begin His mission of bringing Heaven down to Earth. So He went to see His cousin John the Baptist. And in obedience to His Father's will, Jesus was baptized by him in the Jordan River. At once, the skies opened up and the Father expressed His great pleasure. This is my beloved Son in Whom I am well pleased. Then, the Holy Spirit descended from Heaven like a dove and landed on Him. Immediately, He was given the power He needed for the mission He was called to perform. Now totally dependent on His Heavenly Father and empowered by the Holy Spirit, Jesus began to show the world what it meant to be a man in right relationship with God. Jesus demonstrated for us what the Father's will is through every Word and deed that He performed. He showed love and compassion toward everyone He came into contact with and performed all sorts of miracles. Going about doing good and destroying the works of the devil, Jesus modeled what man was meant to be from the beginning - a creature formed in the image and likeness of God; a created creator with power and dominion over everything in the visible realms. But the task was too great for one man, so He gathered unto Himself twelve of His trusted friends and made them His disciples. He taught them the meaning of His parables and let them in on the secrets of the Kingdom. He trained them to be co-laborers with Him in the Harvest. He taught them how to be and to do all that He was and did. And asking that the Father's will be done on Earth just as it is in Heaven, He showed them how to pray. Together, they healed the sick, raised the dead, cured those with leprosy and cast out demons. They gave as freely as they had received. Finally, the time came for Jesus to complete His mission. In agony, the Son cried out to His Father asking for this cup of suffering to pass from Him. But the Father closed His eyes and spoke through trembling lips, My beloved Son I am so sorry. But you and I both know there is no other way. Yes. Jesus knew. So He yielded His will to the Father and became obedient unto death. And so it was that the Son of Man offered Himself up as the Sacrificial Lamb that would take away the sin of the world. With the betraying kiss of a friend, Jesus was carried away and tortured. Evil men shredded His skin and the pure white Tunic of His humanity became soaked in blood. The Roman soldiers beat, mocked and fastened the Lamb to the Altar of Sacrifice. His hands and feet were nailed to its corners and the cross-shaped Altar was covered in blood. Then Jesus cried out with a loud voice that shook the heavens, It is finished! and He bowed His head and died. The Lamb was slain - the sinless blood of the Son of Man making atonement for all. In Heaven, the Father wept and the angels stood in shock. Below, the Devil and his demons celebrated. Death, Hell and the Grave roared in victory. But on the third day, the Resurrection Power of a Holy Father raised His Son back to life! And the enemy was defeated once and for all. Early Resurrection morning, a devoted follower arrived at the Tomb. Seeing her Lord, she ran and falling at His feet, she embraced Him tightly. Do not cling to Me Mary, for I have not yet been glorified. But go and tell the others what you have seen. I will join you later. Jesus watched Mary run off in excitement and smiled. Then He looked up to Heaven and faded out of the visible and back into the realm of the invisible from which He had come. The angels stood in amazement as Jesus made His way into the Throne Room of God. Wearing only a linen cloth around His waist, the marks of His Passion could clearly be seen. Tears flowed from the Father's eyes as His Son carried a blood soaked Tunic draped over His outstretched arms. Arriving at the foot of the Throne, Jesus knelt down and offered it up to His Father. You have done well My Son. I am so very proud of You. The Father took the blood soaked Tunic from His Son and walked over to the Mercy Seat. With great power and authority He wrung the blood out and it poured down over the Throne of Grace. Now at last, they may come boldly before Me. When I look through Your blood I will no longer see their sin and once again we may have fellowship with one another. With the blood now removed from the Tunic, the Father placed it on His Son. Then, He lovingly placed the Robe, Ephod, Breastplate and Turban of Holy Priesthood on Him as well. em>Because You have done My will, I am giving You all power and authority in Heaven and on Earth. And as their eternal High Priest, You shall make intercession for them and be known as the one and only Mediator between God and man. Now, go back My Son and tell them what they are to do. Thank You Father. I will. Then, Jesus turned and headed back to the Earth. For a period forty days He appeared to many and confirmed all that was done amongst them. Finally, when the time came for Him to leave again, He gathered His closest followers to Himself and said, All power and authority has been given to me in Heaven and on Earth. Therefore, you are to go into all the world and make disciples of all nations. Baptize them in the name of the Father and of the Son and of the Holy Spirit. Teach these new disciples to do everything I have commanded you to do. And know that I shall be with you always even until the end of the age. As He began His ascent back to Heaven, one of His followers called out to Him, Lord, will You now restore the Kingdom to Israel? Jesus smiled, It is not for you to know that which has been kept under my Father's authority. But You will receive power when the Holy Spirit has come upon you. And with that power, you shall be my witnesses both in Jerusalem and in Judea as well as in Samaria and even unto the farthest reaches of the Earth. Then, Jesus disappeared into a cloud and two mighty angels descended out of it. They promised those who had gathered below that their Lord would one day return just as they had seen Him go. Up in Heaven, having completed all He was sent to accomplish, the Son joined His Father once again and together with the Holy Spirit, the Trinity looked down on the Earth. And all of the angels came to see what they were looking at. On Earth, the saints had gathered and were praying earnestly for the Gift Jesus had promised them. The Holy Spirit asked the Father Shall I go to them now? The Father maintained his gaze on the blue planet.No. Not yet. We shall wait and see how much they have learned and how badly they desire that which I have promised them. The saints continued to pray as if receiving the Gift of the Father that Jesus had spoken of was their only desire in life. Day after day they prayed and waited, prayed and waited, prayed and waited. Pleased, the Father smiled and turned to the Holy Spirit and said, All right. Now You may go. Fall on them like fire and give them power to continue the work My Son started. With that, the Holy Spirit descended and fell on the saints with a fire that has spread even until this day. Now, Jesus turns to us and says, As the Father sent Me, so I am sending You. Now go in the power of the Holy Spirit and make my Father will be done on Earth as it is in Heaven. 8 Owe nothing to anyone except to love one another; for he who loves his neighbor has fulfilled the law. 10 Love does no wrong to a neighbor; therefore love is the fulfillment of the law. WAIT!?? I thought the law was not to be followed anymore - or so say a LOT of Christians these days. Hmmm. Even Paul seems to completely disagree with that idea. That's right, to love your neighbor as yourself is to... obey/fulfill the Law of YHVH, just like Yeshua did. And in addition, to "love the LORD your God with all your heart, mind, soul and spirit" is to do the other commandments that preceded the ones mentioned by Paul above. 2 By this we know that we love the children of God, when we love God and observe His commandments. So, this side of the cross, what commandments are we still to be keeping? The big 10 baby! I see nothing that requires me to follow the so-called 613. Did you catch it? Some say obeying YHVH is akin to witchcraft. However, YHVH Himself says through his prophet Samuel that rebellion (i.e. disobedience) is what is compared to witchcraft. He also says that YHVH cares more about our obedience than any sacrifices we might offer in place of it.